southernbellewriter: Great News For Me! Friday, I discovered that my book, No Place for a Lady was voted as one of the Best of 2009 books for Crossings Book Club! The Jewel of His Heart was listed as one of the Best of 2009 on Christian Book Distributors and has only been out since October. Needless to say that's a wonderful thing for me and I was excited to see some of my writer friends on the list as well. Tracie Peterson and Tamera Alexander are both favorite authors of mine and I've met them both. Having Tamera endorse The Jewel of His Heart was truly a shining moment for me. I wanted to let those of you who read my blog and live in the Marietta area know that a friend of mine, Eva Marie Everson, will be book signing at Sweet Spirit Christian Bookstore between 2-5. Eva grew up in South Georgia but lives in Florida now. 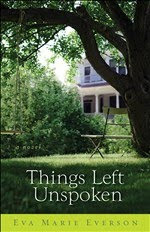 She has written a slew of books and her newest release by Revell is Things Left Unspoken. 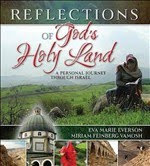 I have a copy of her book, Reflections of God's Holy Land and you can bet I'll be taking it to have her autograph it for me. Later, she will be speaking at North Metro Church on Barrett Pkwy at 6 pm. Congratulations on having your books on two Best of 2009 lists. What an accomplishment. Just look at the company you're keeping! Impressive! Enjoy the thrill. I attended a workshop Eva taught at the Mount Hermon Christian Writers Conference. She's a dynamic speaker and seems like she'd be a lot of fun. Congratulations on having your two books listed on "Best" lists. I'm sure you are flyin' high!!! Congratulations, sweet lady, on having your books on the Best 2009 lists. That's wonderful! Once again, I wish I lived closer so I could go to the signing, I'll stop by and visit Eva's site. Thanks, everyone. I'm pumped! It was a delight to meet Eva and chat with her. I've got her new book to read and can't wait but I'd already stared a new one. So many books, not enough hours. All your books should be on the best seller list as you are a great writter. Eda, your sweet comment is the reason that I work all that much harder on my current work in progess. Thanks for your continued support. God bless! What an accomplishment. Just look at the company you're keeping! Impressive! Enjoy the thrill.